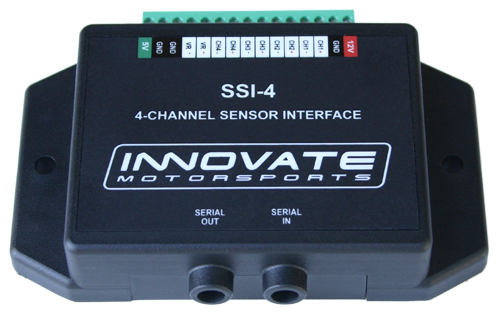 Innovate SSI-4 (4 Channel Simple Sensor Interface). The SSI-4 device is a simple sensor interface that adds 4 inputs to an MTS Log Chain. The SSI-4 may also be used as a stand-alone device for logging data directly into a laptop with the included LogWorks software or it can be used in conjunction with any other MTS compliant device. Channel 1 is a direct RPM input by default, and can also be configured for external 0-5V or frequency. Channels 2-4 are configured to digitize external 0-5V analog signals by default but they can setup to directly measure frequency (like driveshaft speed) or duty cycle (for injectors). The SSI-4 is also a key component of Innovate Motorsports' Modular Tuning System (MTS). Using the SSI-4's serial ports you can daisy-chain other Innovate devices such as the XD-16, AuxBox (LMA-3), LC-1, DL-32, and TC-4. The SSI-4 includes the SSI-4, Program Cable, Patch Cable (to daisy chain with other MTS compatible devices), Mounting hardware, and cd which includes software and manuals.